Ethereum’s native token, Ether, the third largest cryptocurrency in terms of market cap, has reached an all time high of $1,069. 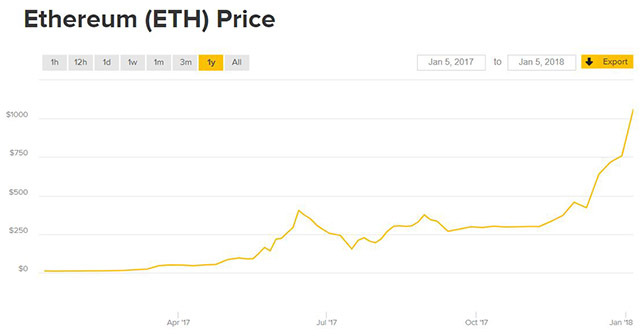 According to Coindesk’s cryptocurrency price tracking utility, in under a year Ether has gone from $10.35 on January 8, 2017 to over $1,000 on January 5, 2018. It is speculated that the cryptocurrency hit an all-time high as a result of a multiple-day rally. Additionally, just a couple of days ago, the Ethereum foundation revealed its plan to offer millions of dollars in grants for scaling research, which might have played a role in the sudden jump in value. Ether represents a total of 13 percent of all cryptocurrencies in the market today, reaching a total market capitalization of $100 billion. The cryptocurrency traded between $700 and $800 for most of the second half of December, 2017. However, over the last week, Ether has been trading up 40 percent, and has reached $1,000 on multiple major exchanges around the world. Despite its tremendous growth over the last year, Ethereum has lagged behind Ripple, which is the second biggest cryptocurrency by market cap, and Bitcoin, which represents a total of 32.5 percent of all cryptocurrencies in circulation today. Ripple has also seen major growth over the last 30 days, marking a 1,300 percent rise in valuation.